The Spirited 230 ‘Power’ is a very compact design for camping style cruising with accessibility to some of the best cruising grounds by road! This is a trailerable planing hull power cat but because of the use of a light-weight sandwich flat panel kit it is much lighter than your average production cat of this style and size. This is not only an advantage for towing and less required horsepower but also aids in general handling and usability. The Spirited 230 enables you to get to those usually ‘hard-to-get’ locations without the unnecessary stress of the delivery via water which can be affected by the wrong weather conditions. Of coarse there is always a compromise, the 230’s accommodation is ‘compact’ yet still retains a reasonable level of comfort for periods of up to 2 to 4 weeks at a time. Being trailerable means that if the weather did turn bad during your holiday period the boat could be loaded onto the trailer and alternate accommodation could be chosen. The Spirited 230 will be ideal for fishing offshore especially if staying overnight with the conveniences aboard. Best of all, after the holiday/fishing day out simply hose off and park in the back yard/undercover out of the way. Access into the cockpit is via a generous swimming platform between the twin outboards. From here a convenient walkthrough transom allows you to walk directly into the cockpit. The transom is closed off with two doors when underway, as does the coaming and aft cockpit seat which hinges back into position for a more secure environment. While at anchor the walkthrough area could remain open through to the swimming platform for access to the water, dinghy etc. Cockpit The cockpit has seating all-round including just behind the main bulkhead where there is a small table for dining/drinks etc. This area is also out of the weather when at anchor as is sheltered. Shelter All-weather clears can be installed along the edge of the cabin roof extension over the cockpit for a very protected area. For the keen fisherman, the cabin roof extension and seating in the cockpit could be minimized for a more functional fishing area. Interior Internally the accommodation is quite comprehensive for this sized boat. There is a functional galley and dinette area opposite in the wheelhouse with a separate helm station forward of the galley. In the forepeak there is a queen sized berth with plenty of headroom for sitting in bed. Adjacent to this is a head hidden below a seat. Large hatches and portlights into this area make it light and airy. Decks To access the foredeck is a large bi-fold window in the centre panel of the windscreen. This allows easy access to the foredeck in complete safety as well as providing excellent ventilation to the wheelhouse. Performance Having a light weight disposition, the Spirited 230 performs very well with smaller motors. 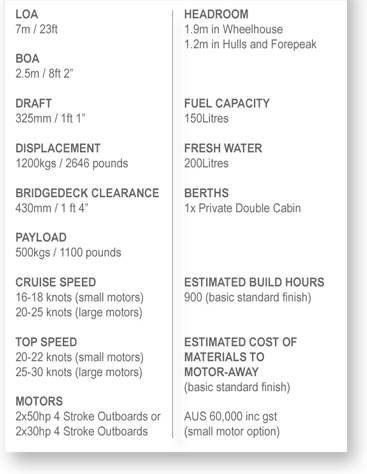 Option 1 is 2x 40hp 4 stroke outboards which delivers cruise speeds of 20 knots with a top speed of 28 knots. The maximum horsepower for this design is 90hp per side. Kit packages are available for this design and the options can be viewed in the Spirited 230 Kit page. How to Order your Spirited 230?